It is somewhat curious that this Australian premiere production of this multi-award winning play has occurred eighteen years after its original successful staging at London’s Royal Court Theatre in 1997. The content of the play, drawn from the life experience of its main characters, is engrossing, as progressively all but the publican, Brendan, reveal that there is more to their life stories than is first apparent. The play is set in a ‘typical’ local pub in rural Ireland, meticulously recreated in a set designed by Dale Ferguson, complete with a piano in the ‘back parlour’, and a fire place to keep the drinkers warm. To the pub progressively come a couple of the local ‘regulars’, who share the local gossip and, in spite of themselves, express their long- standing animosities towards each other, whilst consuming large numbers of ‘pints’ (of Guinness) and ‘small ones’ (shots of whiskey). Into this small gathering, comes Finbar Mack, a businessman in his forties who has returned to the town after exploring the broader world outside, for which venture he is somewhat resented by the locals. He introduces Valerie, the ‘new resident’ in the town, a woman from Dublin who has moved into ‘ Maura Nealon’s old house’. The men set about trying to impress Valerie, who is a ‘fine girl’, with a series of stories about past events in their lives, most of which involve ghostly figures whose identity remains mysterious. Their story-telling abilities vary: it is not only Jack, the local car mechanic and garage owner, who makes ‘heavy weather’ of one of his yarns, as Jim the slightly dim-witted ‘loser’ handyman tells him. The critical point in the play, however, is when Valerie gets to tell ‘her story’. Unlike the others, Valerie’s story and its ghostly associations is based on a real life experience – the death of her five year old daughter after an accident at the pool in Dublin where she was learning to swim. This leads to the break-down of Valerie’s marriage and her decision to explore life in a quieter part of Ireland. Valerie’s ‘difference’ from the men is highlighted in two ways: firstly at a personal level by her willingness to be open and honest about her own experience, and secondly by her city origins, expressed most sharply when, offered a drink, she asks for a white wine, rather than the rural man’s standard – Guinness or whiskey. 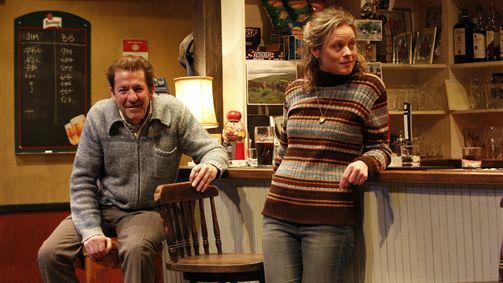 The Weir is a good play, not especially Irish (except for the drinking perhaps? or is that to stereotype? ), which explores effectively the problems some men have with communication, and the differences between rural and city life. I don’t think it is ‘a modern masterpiece’ as one critic described it , but one remains engaged with the characters throughout and there are lots of humorous bits. The acting in this MTC production was evenly good with no one really standing out. Sam Strong has clearly provided energetic direction for the production moves along snappily. The MTC’s choice to stage it in the smaller Fairfax Theatre was inspired as it enables the audience to feel drawn into the intimacies of the story-telling, which makes for a good night at the theatre. Bob is a committed theatre-goer. I like this review by Bob Glass very much. It is clear, succinct and yet broad enough to give the reader a feeling of being present and moving along with the whole rythm of the characters and their varying experiences. Even when poor Valerie elected to drink white wine instead of the mandatory Guinness or whiskey ( I know a special group of three women who do just that ) Bob is understanding and tolerant and carries us along with a fascinating study of beautiful human nature in all its nuances..